Taille de cet aperçu PNG de ce fichier SVG : 471 × 561 pixels. Autres résolutions : 201 × 240 pixels | 403 × 480 pixels | 504 × 600 pixels | 645 × 768 pixels | 860 × 1 024 pixels. English: Logo of the Comedy Central TV series w:South Park. The logo is too simple to meet the U.S. threshold of originality: the sign is in a utilitarian shape, and the text is acceptable because fonts in general are considered to be in the U.S. public domain. Though copyright restrictions do not apply here, this image is still subject to trademark. Joyeux Noël Charlie Manson ! Talk:What Would Brian Boitano Do? 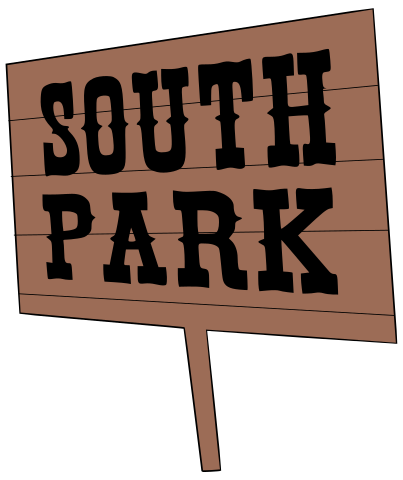 Ce document provient de « https://fr.wikipedia.org/wiki/Fichier:South_park_sign.svg ».